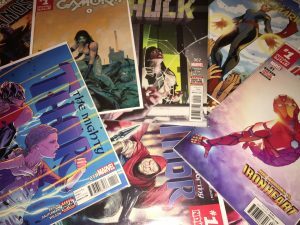 I'm reading and collecting comic books again! I know, exciting right? Ok maybe not for you. But for me it's a reconnection that I realized I'd craved for a long time. As I've mentioned recently in previous posts, I had been so focused (as I needed to be) on building my business and climbing the ladder of success that I'd put aside many of things I loved to make time for the work I had to do. Sacrifices right? But now that I've attained a degree of financial and time freedom, I'm able to really get back to those things I love. Sure I'm still working to build my business(es) to newer and higher heights (in fact I think I'm working more now than ever before), but I've really made sure to make time for those things that were missing these past years. And that's important. BALANCE. It can't all be one sided and work work work or you risk (like I did) tipping into BURN OUT. There must be a balance of work and play, grinding and relaxing. Trust me. You'll actually be more effective in all aspects of your life when you have BALANCE.